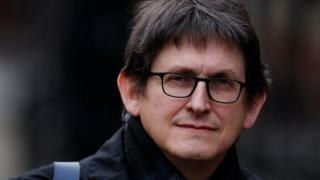 Former Guardian editor Alan Rusbridger will not become the head of the Scott Trust, which owns the Guardian Media Group, he said on his Twitter account. Mr Rusbridger, who was the editor-in-chief for 20 years until last summer, was due to start the role in September. He said newspapers had been "battered by turbulent and economic forces that were difficult to foresee last summer". The current chair of the Scott Trust, Liz Forgan, will remain in post until her successor is appointed. Mr Rusbridger will also resign as a trustee. In an email to Guardian staff, published by Buzzfeed, he said he had a "fantastically interesting new life in Oxford" to look forward to. He wrote: "I have been on the Trust long enough to understand its role. "We all currently do our journalism in the teeth of a force 12 digital hurricane. It is surely obvious to anyone that changed circumstances will demand dramatically changed solutions." Ms Forgan said: "Alan Rusbridger's contribution to the Guardian over 20 years as editor-in-chief is immeasurable. "He has been the creative leader of this place and an inspiration to generations of journalists. His decision reflects his enormous integrity and his dedication to the Guardian." Mr Rusbridger joined the Guardian in 1979 as a reporter and became editor in 1995, succeeding Peter Preston. Under his management, the paper moved from its office in London's Farringdon to Kings Cross and embraced digital journalism. Mr Rusbridger also changed the size of the newspaper from broadsheet to Berliner format. Mr Rusbridger was succeeded at the Guardian by Katharine Viner, the paper's first female editor-in-chief.